1 What is an ingrown eyelash? An ingrown eyelash or trichiasis is a condition when the eyelashes grow in an inside direction instead of growing outside the eyes. To be more precise the eyelashes grow backward towards the eyes instead of growing away from it. As the ingrown eyelashes grow, it may cause a lot of discomfort and irritation in the eyes as well as the eyelids. An ingrown eyelid is more common in adults than children and it may occur on either side of the eyelid, i.e., upper or lower eyelid. 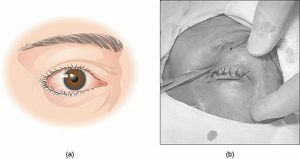 Blepharitis: It is a chronic infection that is caused due to blockage of the meibomian gland (Small oil gland present in the eyelid). Streptococcal bacteria are among the most common bacteria leading to such a condition. Infections and allergies are other causes of blepharitis, whereby prolonged chronic blepharitis can cause an ingrown eyelash. Sty on the Eyelid: Small bumps on the eyelids are called sty or stye that causes discomfort and irritation that are not serious. The main factors responsible for causing a sty are bacterial infections. It mostly takes around a week or two to heal on its own. The growth of the bacteria into the roots or follicle of the eyelashes and tiny oil glands on the eyelids causes a change in the growth of eyelashes. The blockage and infection of pores restrict the growth of eyelashes in the outward direction leading to this condition. Trauma or Injury to the Eyelids: Trauma or injury to the eyelid can be threatening because eyelids protect the eyes. While the injury on the eyelid heals, the skin along the eyelid may deform and if the wound is left to heal in an uncovered state, it can cause ingrown eyelashes. A temporary solution to the pain and irritation are medicines that are easily available over the counter. They include eye drops and ointments that are prescribed to treat redness, pain and irritation. However, the ultimate solution to this problem is removing the eyelash. Corticosteroids: This method is adapted to calm the redness and inflammation of the eyelids. Although they are easily available as an OTC medicine, it is recommended to consult a doctor before its usage. They can ease the symptoms but are not capable of treating ingrown hair. Prednisolone is another form of corticosteroids that help in reducing inflammation and redness. It is strictly advised that pregnant females, allergy to steroids or people with kidney or liver diseases should refrain from its consumption. Artificial tears: These are used to treat dry eyes and act as an oral lubricant that relieves discomfort and irritation. They do not treat ingrown eyelashes but offer relief for dry eyes by reducing scratches in the retina and facilitating smooth movement of the eyes. They are available in forms of ointment and drops. Epilation: This method is used to remove hair from any part of the body. Shaving and waxing are the common forms of epilation that are either done manually or surgically. Although considered least complicated, there are chances of reoccurrence. How to remove an ingrown eyelash? It’s completely safe to remove an ingrown eyelash. On most occasions to get relieved from the pressure, it becomes important to remove the eyelash. An infected person may pluck the eyelash himself/herself or take help of another person to do that. There is a possibility of the eyelash to grow again in future which is why it’s strongly recommended to consult an ophthalmologist to fix the problem. Doctors use forceps or pincers to pluck out the ingrown eyelash. After plucking, doctors mostly prescribe eye drops to reduce the discomfort until the eye is completely healed. In severe cases, doctors might also perform radiosurgery wherein the doctor would pass a current inside the root of the eyelash termed as radio waves. It would eventually get rid of the eyelash. Eye surgery is mostly recommended for people having the recurrent condition. Great article! I like the info provided by you. I am suffering from Ingrown eyelash and this article is very helpful for me. Thanks and keep sharing.